Back in my World of Warcraft days, I often heard guild mates and fellow WoW players lament the absence of persistent character housing. Whenever Blizzard released an expansion, I always heard friends and acquaintances lament the absence of a place to hang their hat. I never quite understood the appeal of player housing. Of course I understand the values and feelings related to being at home, a sensation still too rare in videogames, but why bind players to one place in such an expansive world. What would I use a home for? Many hours into Elder Scrolls V: Skyrim and I am beginning to understand the value of hearth all my own. Above is an image of my Argonian Skyrim character in my home. It is in the town of Whiterun, nestled conveniently next to a blacksmith and a public forge, where I can craft my tools of the trade. When I fast travel to town, the house is just a moments away. It started out a cobweb infested disaster, but like most player housing, I could upgrade it piece by piece. It comes with an alchemy station where I can brew my poisons and potions. It also has a pot for cooking up restorative cuisine using food items I encounter on my journey or any of the meats, herbs, and vegetables stocked in the nearby cupboard. Chests and bookshelves sit conveniently near both the fire and the alchemy table, allowing me to store provisions I will use for later. It feels quite “homey” if I do say so myself. The beauty of home ownership in Skyrim is its utility. There is so much crap in this game. If it is not bolted down, you can probably add it to your inventory. Go out for a quick mission and you will return with a pack full of mushrooms, thistle, butterfly wings, and dragonflies, not to mention pounds and pounds of armor you might sell off or disenchant. Much of this stuff can be used to craft items or enhance weapons, but not necessarily right away. Yet every character can only carry so much without slowing their movement down to a crawl. The solution? By a house and store your belongings knowing you will never have to fear bandits or thieves making off with the goods. The bookshelves are also useful not only to store interesting pieces of game lore, but to keep recipe books or notes you might want to peruse later. The home also has a weapon rack and wall plaque. Mine carries a pick axe I only use when mining and a sword I mean to enchant soon. The plaque, however, carries a useless but ceremonial axe. See, I started viewing my house as a giant chest, now I view it as a place to store my memories. 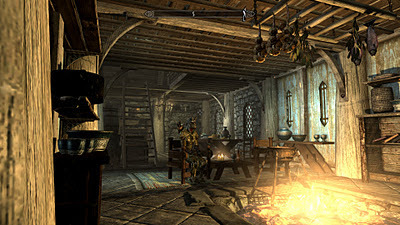 I have filled my bookshelves with selectively chosen tomes my character might read, stored interesting artifacts from my journey in various cupboards, and filled my dresser with outfits I snagged outside the walls of Whiterun. I have thus far shunned owning property in other towns and often return to my cabin before logging off. I even feel a new found attachment to the town citizens.Slowly but surely, I am turning my house into a home. If only it's as easy to build a home in the real world! All residential home builders would have a blast.